The foundation of any good financial plan is also something most of us hate doing. I’m going to say a word to you and some of you are going to cringe. Budget!! Don’t stop reading. Stick with me!! When was the last time you truly made a budget that actually balanced at the end of the month? Actually, tracked your spending and I mean tracked every dollar? Most of us are in budget template syndrome territory. We put some numbers down on a piece of paper and scratch our heads, wondering why nothing added up at the end of the month. Your biggest wealth building tool you have is your income. We have to start making a plan for every single dollar, before the month begins. If you make $4,000 a month and you only budget for $3,500, what really happens with that extra $500 for that month. For most, it disappears, and we don’t really know where it went. For others the numbers turn red each month and we rely on debt to get us through it…..yikes!!!! So how do we do an every dollar budget? For starters, you have to know how much income is coming in each month, so you know how much you have to work with. Don’t count overtime, that’s extra, because we can, and do get injured, which means light duty and no overtime. We never want our overtime becoming a part of the daily living needs (one of the biggest pitfalls I see us make in this industry)! After you know how much you have to work with, start determining exactly how much you plan to spend on every category you can think of. There is some obvious ones like house/rent payments, transportation, food, ect, but I want you to dive deep on this one. Break out everything down to the dollar. Haircuts, childcare, entertainment, clothing, every category. 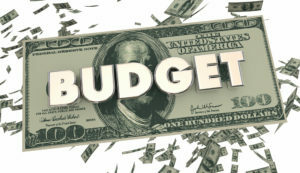 Remember this is an every dollar budget not an almost every dollar budget. Once you have that part done the fun starts. We actually have to track what we spend and make sure we are staying on the budget. Did everything go as planned or do we need to make some adjustments? That means making sure we are not going over budget or even under budget. If we are, we have to adjust because our budget has to balance. We’re not in Congress after all. One of my favorite resources out there to help you learn how to get this process going is fellow Ramsey master financial coach and officer, Jason Hoschouer (aka “Motorcop”). He’s written a book called “Badges and Budgets” as well as developed a class called Budgeting 101 that is available through Law Enforcement Learning, dedicated to in depth training on how to do the everydollar budget. With some practice, you’ll likely soon find yourself spending less time worrying about your money because every dollar will have a purpose. The amount of time you spend on it monthly will lessen as it starts to become second nature. Your stress levels will start to come down as you work the budget. You’ll instantly see if you need to find some OT jobs to pay some debt off to make your budget balance, or if you have some excess to start saving for that dream vacation or car!